Plenary: Fumiaki Fujibe (Meteorological Research Institute). Chen-Yi Sun (National Chin-Yi University of Technology), Soushi Kato, Wen-Pei Sung, Hsien-Te Lin, Fu-Jen Wang, Wen-Sheng Ou. A thermal environment investigation of the urban street canyon in a hot and humid city, Taichung City, Taiwan. Victor L. Barradas (Universidad Nacional Autonoma de Mexico), Monica Ballinas-Oseguera. On the biometeorological (re)design of urban parks in Mexico City. Hiroyuki Yamada (Wakayama University), Mami Yokota. Research on the park breeze from the Daisen park, Osaka pref. Luciano Massetti (National Research Council), Martina Petralli, Simone Orlandini. The influence of solar radiation exposure on air temperature difference in a parking lot: a case study in Florence, Italy. Derald A. Harp (Texas A&M University - Commerce), Chelsea Suttle. Relationship between air temperature, relative humidity, wind speed and evapotranspiration in green roof plants in the southern United States. Plenary: Greg Carmichael (University of Iowa). Takeshi Sugimura (Earth Simulator Center, JAMSTEC), Keiko Takahashi, Makoto Iida. Numerical wind analysis on complex topography using multiscale simulation model. Juergen Baumueller (University of Stuttgart), Ulrich Hoffmann, Uwe Stuckenbrock. Urban framework plan "hillsides of Stuttgart"
Plenary: David Sailor (Portland State University). Julien Desplat (Meteo-France), Jean-Luc Salagnac, Raphaelle Kounkou-Arnaud, Aude Lemonsu, Morgane Colombert, Mireille Lauffenburger, Valery Masson. EPICEA Project [2008-2010], Multidisciplinary study of the impacts of climate change on the scale of Paris. Yujiro Hirano (Nagoya University), Hidefumi Imura, Toshiaki Ichinose. Effects of the heat island phenomenon on energy consumption in commercial and residential sectors of metropolitan Tokyo. Kristina Trusilova (Max-Planck Institute for Biogeochemistry), Galina Churkina. The response of the terrestrial biosphere to urbanization: land cover conversion, climate, and urban pollution. Pavel I Konstantinov (Lomonossov Moscow State University), Alexander V Kislov. 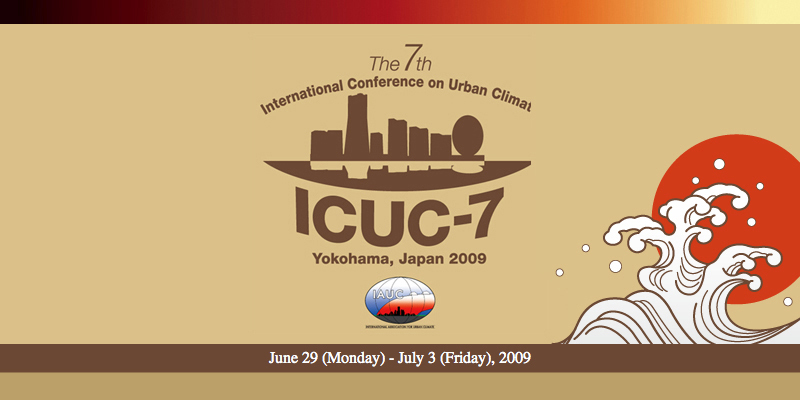 Application of urban microclimatic model for simulation of temperature regime of Moscow region. Mace L Bentley (Northern Illinois University), Walker S Ashley, Tony Stallins. Radar delineation of urban-enhanced thunderstorms for cities in the southeastern U.S.
Plenary: Yasunobu Ashie (Building Research Institute). Sylvie Leroyer (Mc Gill University), Jocelyn Mailhot, Stephane Belair, Ian B. Strachan. The Canadian urban off-line modeling system applied on the Montreal metropolitan area : which benefits for weather forecasting and Urban Heat Island evaluation ? Ana Maria Monteiro (Porto University). Climate - air quality - health: an (un)desirable nexus of causality for man? Chen Liang (The Chinese University of Hong Kong), Edward Ng, An Xipo. Air path detection in urban environment and its implications on morphological analysis and ventilation assessment: a new way to solve and old problem? Chen-Yi Sun (National Chin-Yi University of Technology), Hsien-Te Lin. The relation between heat island and land-cover in a subtropical city, Tainan, Taiwan. Paul Dostal(University of Mainz), Antje Katzschner, Michael Bruse, Sebastian Huttner. Quantifying the human thermal-heat stress in central Eurppean cities with BOTworld and on site-interviews as analysing tool to estimate the thermal sensation of pedestrians. Lilly Rose Amirtham (Sathyabama University), Monsingh David Devadas. Analysis of land surface temperature and land use / land cover types using remote sensing imagery - A case in Chennai city, India. Shoko Hashida (Meiji University), Kenichiro Fujisaki, Shinjiro Aoki, Ryoichi Kajiya, Koji Sakai. The effect of improved pavement and turf to improve the thermal environment of parking lots.